How does a city reuse a former basketball arena when the team moves to new digs across town? And what if, hypothetically, that arena is shaped like a pyramid? If you’re Memphis, you fill it with a 535,000 square-foot Bass Pro Shop, then sit back and wait for the apocalypse to arrive. 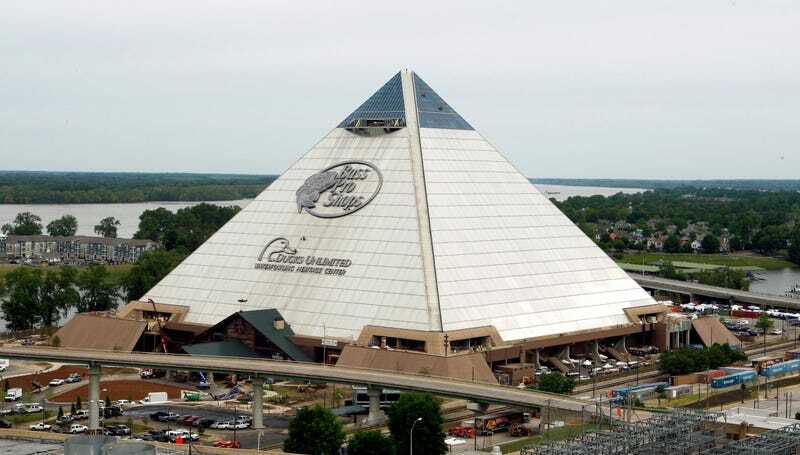 Built in 1991, Memphis’s Great American Pyramid has been empty for over a decade, looming on the skyline like a bad idea conceived after too much cocaine. Numerous proposals have tried to revive the 32-story pyramid but none had the $191 million backing of America’s most audacious retailer. In addition to the sales floor, the store is like a Vegas-scale Bubba Gump outpost including a cypress swamp with live alligators, a bowling alley, a restaurant, an observation deck, taxidermy museum, and a hotel. If these photos aren’t enough to convince you of humanity’s impending doom, there are more images over at Bloomberg Businessweek. The store opened today.